All of us probably know some areas where we could boost our health and happiness — perhaps by exercising more, eating healthier, learning stress management techniques, or nipping a bad habit in the bud — but making a change can be daunting. It doesn’t have to be, though. 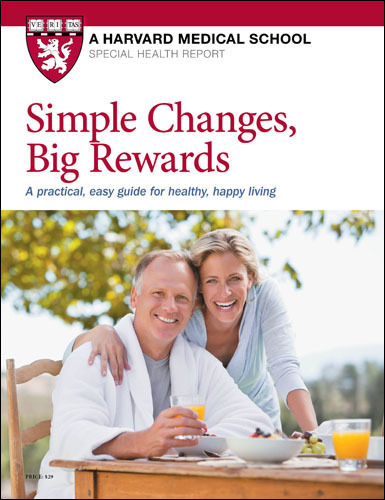 This Special Health Report, Simple Changes, Big Rewards: A practical, easy guide for healthy, happy living, will show you how to incorporate simple changes into your life that can reap big rewards. People can achieve remarkable changes in their lives by taking one small step at a time. The day-to-day choices you make influence whether you maintain vitality as you age or develop life-shortening illnesses and disabling conditions like heart disease, diabetes, high blood pressure, and stroke. In this Special Health Report, Harvard Medical School doctors introduce you to strategies you can stick with. You’ll find out how to create long-lasting change and set goals that are specific, measureable, achievable, and realistic. And you’ll learn invaluable tips for conquering rough spots that may occur as you progress. These are resolutions you can keep. These changes don’t require you to clean out your pantry, invest in gear, or carve out extra hours from your day. 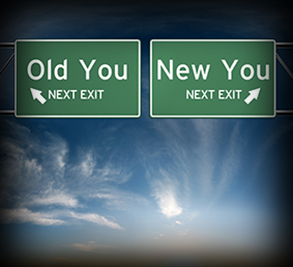 Instead, you learn to replace old habits with new ones. This Special Health Report targets seven goals and gives you six sensible, practical steps for reaching each goal. In Simple Changes, Big Rewards, you’ll master proven tools that will make dieting easier, meals more wholesome, workouts more fun, and stress less disruptive — and will help you invest each day with greater joy and meaning. What’s working: You go, girl (or boy)! I love the title of this report—Simple Changes, Big Rewards. Why? Because getting healthier doesn’t have to be difficult. Given the complexity of medical care today, you might be thinking, “Is he serious?” But after practicing primary care for 40 years, I can say emphatically: it’s true. Small changes can add up to surprisingly big course corrections. But which changes should you make? And how can you stick with them? As an internist, I’ve seen people achieve remarkable changes in their lives one small step at a time. The day-to-day choices you make influence whether you maintain vitality as you age or develop life-shortening illnesses and disabling conditions like heart disease, diabetes, high blood pressure, and stroke. guarantee it will be hard to break, too. This Special Health Report highlights small changes you can make in seven areas of your life to enhance your health and happiness: stick to exercise, eat healthier, lose weight, ease stress, get more sleep, add more joy to your life, and break unhealthy habits. Guided by this report, month by month you make choices that appeal to you. In every chapter, “The goal” sets a target. “Six choices” offers changes that could help you move toward the goal. Each one is graded easy, medium, or hard. If you’re starting from scratch, you’ll find an encouraging foothold. Or, if you’re already engaging in healthy behaviors, you can up the ante to reap greater benefits. Try mastering just one change at a time before moving on to the next. Each month, you can select a different goal from the seven goals or decide to explore further changes within the goal you’ve been working on. While you can choose any of these seven areas to begin with, I usually advise my patients to choose “Stick to exercise” first. There are lots of reasons to exercise, but the main one is you can immediately see results. Wherever you are now on the physical activity spectrum, tomorrow you will see benefits like a better mood or a more restful night’s sleep. Recent studies show that the health benefits from even short bursts of exercise are real. Once you get moving, I find that the other simple changes actually feel even easier. Progress is a great motivator to want to do more.